A. 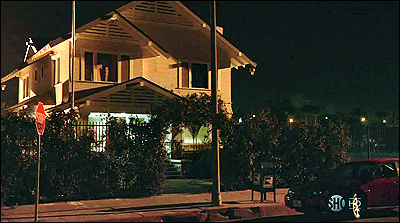 140 Everglade Court, Miami. A. In Episode 3, of Season 7, "Buck the System". The two-story home belongs to Ray Speltzer, a groundskeeper at Briar Cemetery. He's also a crazed serial killer whose idea of fun is to lure young women to his house, dress up as a raging minotaur, and then chase them through his personal labyrinth before killing them. Dexter is trying to convince Debra that it is necessary to stop Speltzer before he kills again. Debra attempts to get a search warrant on Speltzer, but is turned down by LaGuerta. But Dexter has got her paranoid enough about Speltzer that she stakes out his house at night, just to make sure he doesn't harm anyone. Soon, Debra notices some odd sights & sounds coming from the top floor, including a strobing light and driving, heavy metal music. 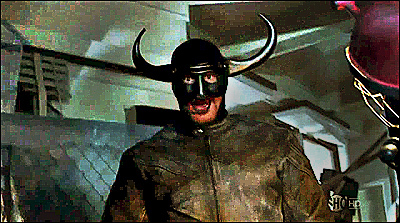 Sensing something is up, she kicks in the front door and heads upstairs, where she finds herself in a bizarre maze straight out of a horror movie, and encounters a rampaging Speltzer dressed in leather a nd wearing a mask complete with giant bull horns and a ring in his nose. 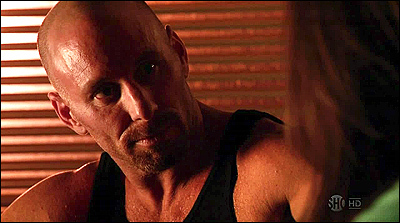 Debra is caught by him, and pulled into a doorway, where she loses her gun in a nest of razor wire. She is just about to be killed by Speltzer, when Dexter shows up in the nick of time and whacks him over the head with a 2x4. Unfortunately, when they go looking for the girl, they find her dead in another room. And in the confusion, Speltzer regains consciousness and escapes. A. A 90-year-old Victorian home, which now serves as office space for a fraternal organization. A. 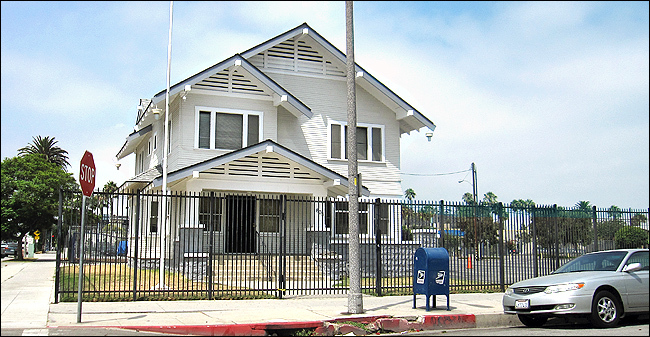 You'll find this building at 805 Elm Street, in Long Beach, CA. That's at the northwest corner of Elm and E. 8th Street, near downtown. It clearly was built as a residential home - in 1912, according to records. But those same records list it now as office space, so I assume that Scottish Rite is using the home for its offices. A wrought-iron fence encloses both the house and the cathedral. I shot the photo below in August 2012. Here is an aerial photo of the location. Here is a Google StreetView. A. In the early seasons, I usually had to hunt down the locations after viewing the episodes, using clues from the various scenes. By the now, though, I've developed a small group of fans, spies & tipsters who kept an eye out for Dexter filming in their neighborhoods, and would let me know in advance when something was about to film there. Between those reports, my own personal reconnaissance around town, and a few new resources I discovered, by the time the first episode airs, I already know most (but not all) of the filming locations, and only need to watch the episodes and match up the scenes with the correct locations. This group of helpful fans includes Rick, Ellen, Elaine, Mia, Joel, Susan, Eric, Jeff, Kerry & others. My thanks to all of them. I then drove to the location and shot the photo you see above, which, of course, perfectly matches the screencap.